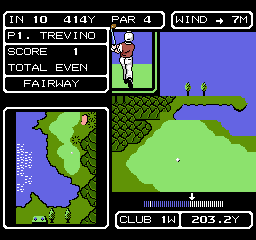 Lee Trevino's Fighting Golf © 1988 SNK Corp. of America. North American release. Game developed in Japan. See the original Famicom version: "Fighting Golf [Model SFX-FI]". Released in September 1988 in the USA.